Mark and I promised after our last extended hiatus that we wouldn’t leave you high and dry again. Then we delivered you 2 blogs and disappeared again. We broke our blogger promise to you and to ourselves. And I’m sorry, though I’m not really remorseful. I’m not remorseful for two reasons, one, because we’ve experienced a lot of change in our personal lives lately, and two it gave me a good topic for a blog return. 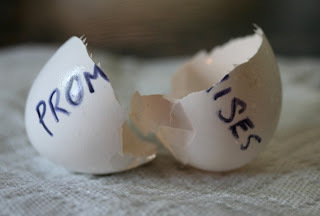 And the truth is, every human being you meet in this life will eventually break a promise they made to you. Whether they do so purposely or life just gets in the way of their obligations, everyone will eventually let you down. Can you count on and rely on your loved one? Absolutely. But we are all fallible and your friends, your family, your co-workers, your politicians, leaders, pastors, the institutions you put your faith and money into will let you down in this twisted world we live. And that is why it is crucial to have a relationship with the One who will never go back on His Word, who will never break His promises to you, and who will always be waiting for you with open arms if you choose to follow Him. These are just a few of the promises God gives us in His Word. Those of you who know Him well, know that there are many more. Regardless of our level of intimacy with Christ, whether we know Him not, or continually strive to grower closer to Him all of us at some point falter under the weight of human disappointments. But when broken promises seem to abound, all of us need to know and heed that the Lord will never leave or forsake you. Christ is always available to talk to, His comfort is always there when you seek it. Dear readers, we have broken our blogger promise, but God’s promises abound. We hope that even though we have been absent you all will readily read and comment as we figure out what our new blogger normal is for us. We promise not to leave you again J.